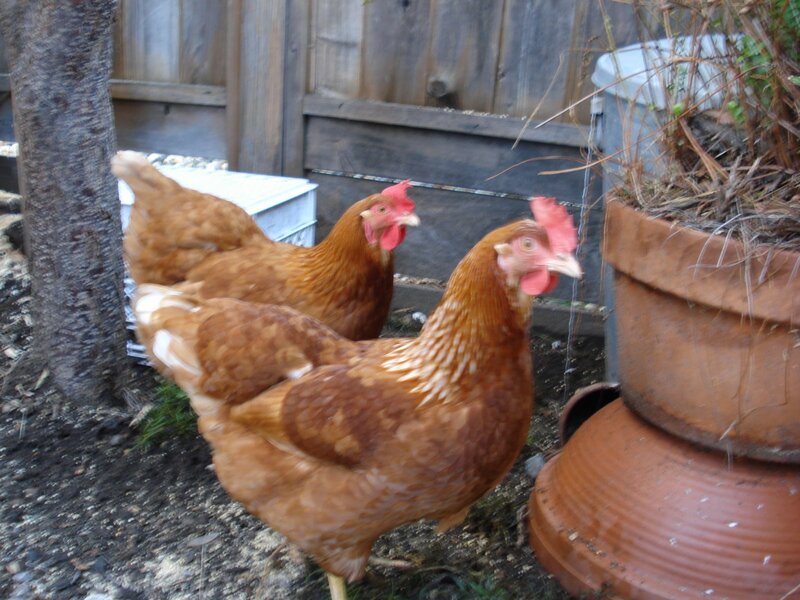 Here are Sally and Lucy, happy I’m sure that they are pet chickens with names. When I got them, I wasn’t much invested in the idea of pet livestock. I didn’t envision harvesting them for meat, as that is a messy job and harder than it seems. ( I learnt this watching hunters clean game birds.) Now, I realize that if they were sick or hurt, I would find a chicken vet. If there is a chicken vet, that is, but I imagine there must be. We are having Thanksgiving tomorrow, on Friday. This is what comes of high self esteem. Instead of working today, in the hospital, and running home to eat a lukewarm held over bird that had been solely prepared by Mr Woolly, while dealing with packs of children. (I know, there are only two, but you have never seen them on school holidays. ), instead of this stressful tableau, we have opted for a Friday Thanksgiving. It’s not a matter of the cards you get, it’s how you play them. Next week, my darling husband has final exams, and then he has a an entire month to relax and do home repairs. I for one am looking forward to it. He is looking forward to half of it. Back, though I wonder if the bow was just a cop out. 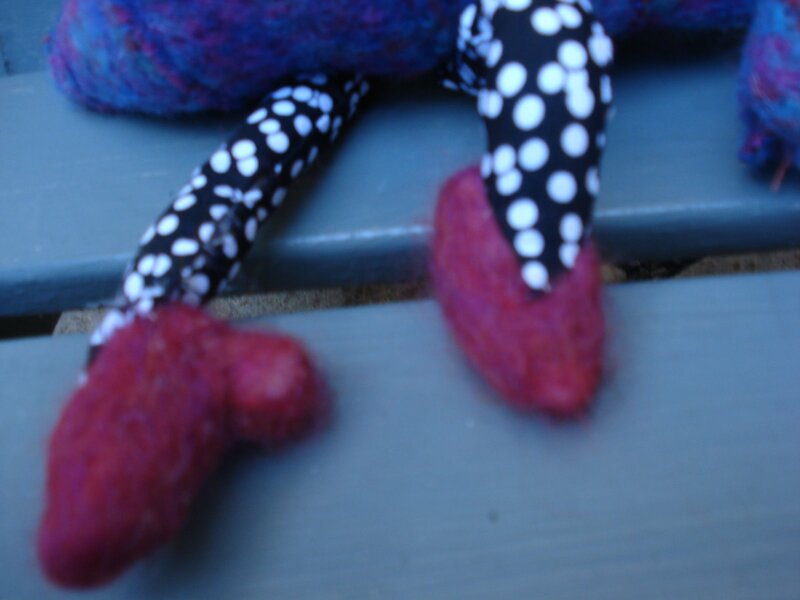 Darling, ( if I do say so), needle felted foot. I like the way I connected the leg to the shoe, to make it all more stocking like. With her even flatter sister. Inspired by this artist. 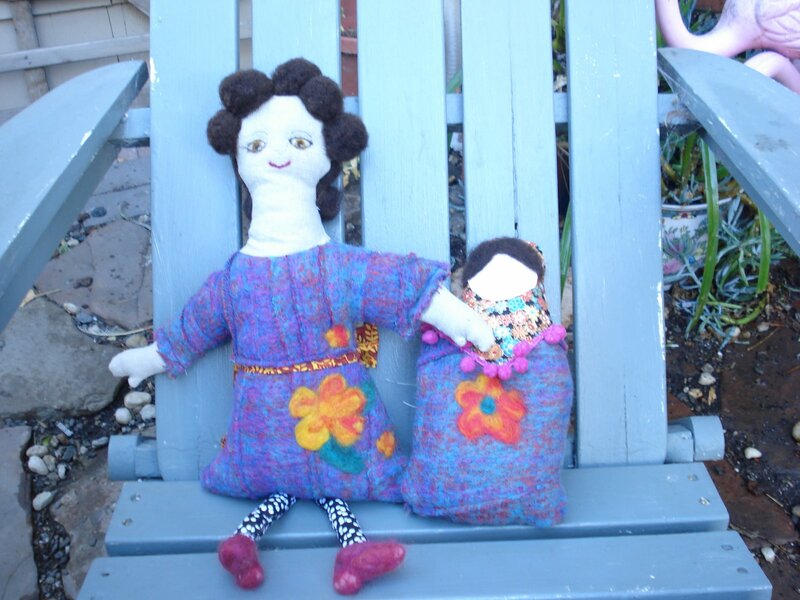 I love, love, love her dolls- all made of felted wool. On the knitting from, I am slogging through a Tomtem jacket, and a shawl. I also took a good look around the sewing machine and am clearing out some random unfinished projects. BUt, I am also working more lately, and it seems to be cuttting into the art time. Here’s for my friend P, who I am slowly convincing to keep chooks. The upstairs is sleeping and egg production quarters. 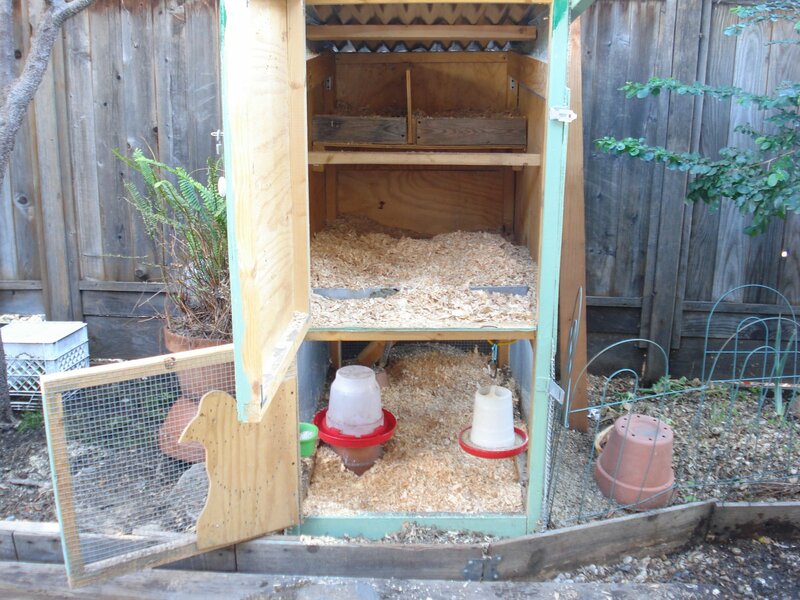 Under the shelf that holds the nest boxes is an open hole that has a ladder down to the eating and digging quarters. They let themselves down and that’s where they spend their time when I am not home. I had planned to move this around the yard, but really the yard is too tiny. If I could move it, then I would probably just leave the chips on the ground floor in place. As it is, once a week I shovel it out and spread those chips plus poo on my roses, who seem to like it. The majority of the manure seems to be produced at night, and that goes to a friend’s compost. In the evening when I am home, I let them out to roam the yard, so maybe four days a week they get time out of the coop. The advantage of letting them out in the evening is that when it is dark they put themselves to bed. I still need to figure some way to hang the water, as they sometimes dump it over. When that happens they do not lay the next day, and they look so pathetic drinking quickly and thirstily when I discover them. Chickens are probably the easiest of the pets in cages I have kept. They have a lot of personality, or maybe I just had low expectations of them, what with the bird brain thing. Much more fun than a rat or a parakeet, and they lay eggs. Inspiration left, woolly dolly right. I made a jacket out of the purple wool and so she is scraps. I needle felted the flower, and I might yet needle felt more design. Also her hair, which I am not sure of. I think I either need to make the head bigger or the hair smaller, or switch back to the fabric hair. 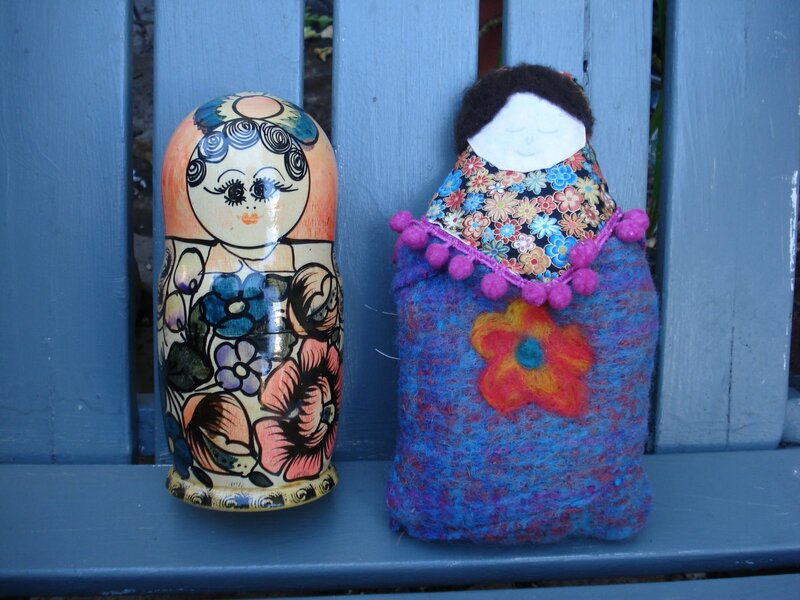 These little dolls are started to become a lovely doodle for me- a way to work in small scale and try things. I am somehow adverse to small quilts. I made a Hope quilt for the Alzheimer’s initiative, and I came home to find a family member using it as a pot holder. ( Yes, this really happened, why do you ask?) It about summed up my own ambivalence for making small scale quilts. What, exactly, are they? How do I display them without putting a lot of holes in the wall? Where do they live? How do I store them? How is storing them in a box different from throwing them away? Somehow dollys, while being clutter in their own right, are different. Perhaps it is because they represent the human form, the more sacred from of human, the baby. 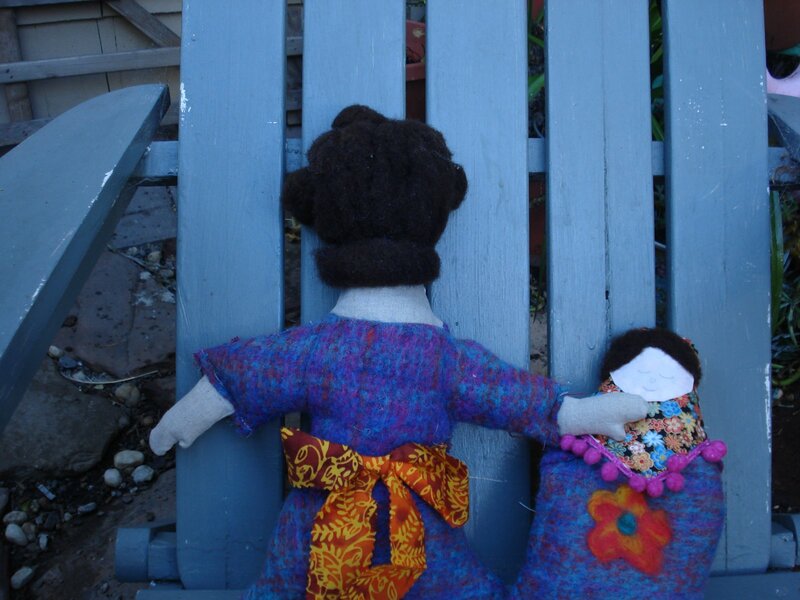 Maybe it’s because I am accustomed to dolls doing nothing and being nothing- they are just dolls. You just look at their little faces, and smile at them, and put them in little groups. Now, I know that there are doll haters out there. I had a childhood friend who’s mother went to a great deal of trouble and expense to make a collection of dolls of the world for her daughter, starting in babyhood. They creeped my friend right out, to the point that she stood on a chair and turned them all to face the wall before she could fall asleep at night. She hated the little staring eyeballs. Yes, she did grow up to be a normal person, why do you ask? The first photo, being, of course, the “after” photo. The mordant- a chemical that you soak the wool in before putting it in the dye bath- was cream of tartar and alum. The cochineal- tiny little red bugs that live on cactus- were soaked and steeped for three days prior. We bought ours from Solvang Spinning and Weaving, in case you need some bugs, too. 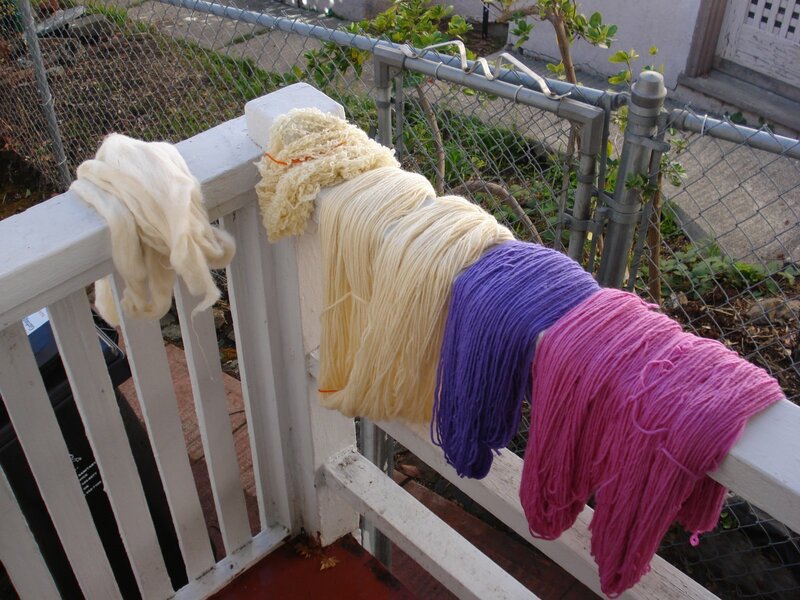 We were able to dye three pounds of wool with only four ounces of bugs, and the bugs seem to have plenty of dye left. E and R dyed with me- it was a lovely day. I didn’t look up mordant or method for cotton, so no fabric came out of this dye day. E did dye two silk scarves- the first came out deep crimson, the second, put in at the end, a pale rose. R was quite please with the new, over dyed color of the Lamb’s Pride. 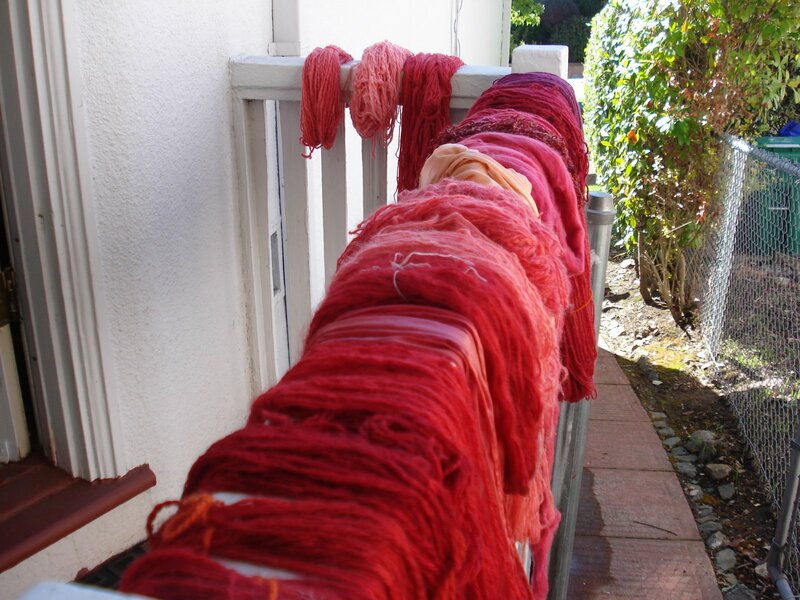 I have always thought that natural dyes were a PITA and not worth the extra step of mordanting. I am on record as saying that I. Was. Wrong. Cochineal is completely, totally worth it. The red is complicated and luminous. It is a blue toned red, which is what I prefer. I have to take another look at this. I’m not much for house decorating, although I appreciate those that do. The seasons seem to move too fast for me to get decorations up and down in a timely fashion. I also am quite judgmental about those houses where they NEVER take down their Christmas lights. 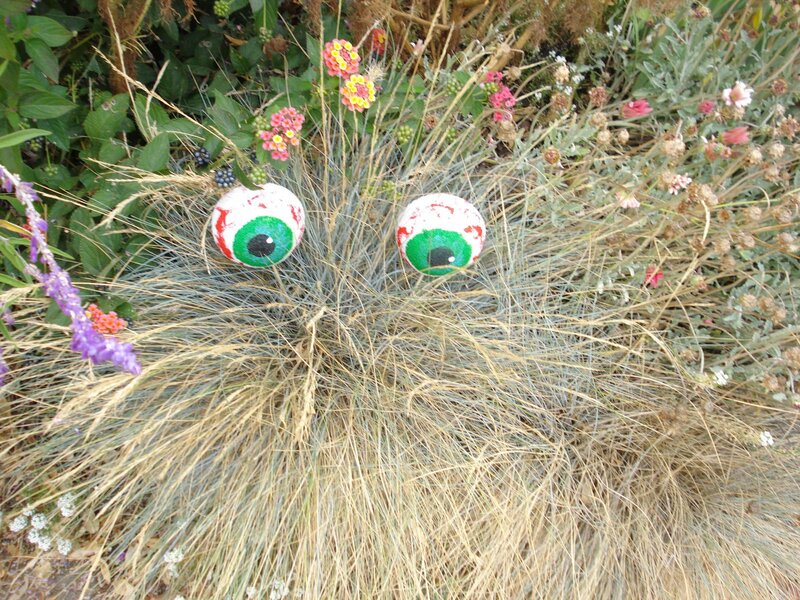 But plant eyeballs? Right up my alley. Bitter Betty tells us how. It is a book shelf quilt, where the books are strips of fabric. Here’s a link, but I’m not sure it will work. Whether you are having fun or not. Most of the month has been fun. Some has not. Son two has had some school problems that seem to be sorted out. I have a new computer and can get back on the internet. I haven’t got any pictures on it, yet, but my Technical Support Husband Unit has rescued the pictures off the old computer. The chickens are still laying and egg each, every day. Practical magic.